Your child will have to take an English comprehension test in multiple choice format. Find out what this means and advice for exam preparation. You feel that there aren't enough publications covering comprehensions in multiple choice format and need more in this style for your child to practice. You're looking to buy a book that has both multiple choice comprehension exercises and story writing – composition – exercises all contained in one publication. You need a book that has plenty of work for your child to do and which contains answers plus mark schemes so that you can mark your child's answers and the stories they've written too. You want a book that offers good value for money, contains lots of activities for your child and is relevant to the independent school exams they'll be taking, and at a good price! You need some advice on what exam preparation your child needs for the 11+ and Independent School examinations. Your child needs advice and practice in completing comprehension exercises as well as in writing stories. Your child needs tips and advice on how to complete the written comprehension tests. You are not sure how to go about helping your child prepare for the written comprehension tests and need some practical advice. You need a book that is easy to use and has the comprehension reading passage, questions, space to write the answers, story ideas, plus space to write them, altogether in one publication. Your child struggles with writing stories for 11+ and independent school examinations and you are looking for a book that offers some practical advice. You feel there just aren't enough publications that offer opportunities to practise comprehension and story writing in genuine exam type format. You are looking for a book that your child will find straightforward to use and easy to understand but it should also have detailed answers so that you can mark the work yourself. 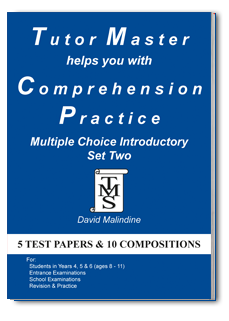 Your child will have to take an English comprehension test in multiple choice format. Find out what this means and advice for Exams preparation. 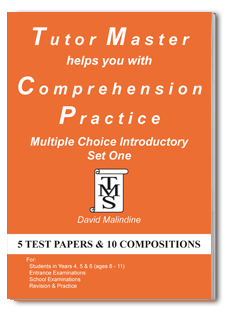 You're looking to buy a book that has both multiple choice comprehension exercises and story writing – composition – exercises all contained in one book (no loose papers to get lost!). You want your child to start to develop and practise their skills at a younger age. You want your child to continue their exam preparation with more exercises to develop and practise their comprehension skills. 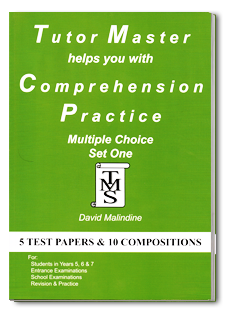 Your child will have to take an English comprehension test in multiple choice format. Find out what this means and advice for Exams preparation. You want your child to continue their exam preparation with more exercises to develop and practise their comprehension skills. Your child will have to take an English comprehension test in standard format. Find out what this means and advice for Exams preparation. You feel that there aren't enough publications covering comprehensions in standard format and need more in this style for your child to practice. You're looking to buy a book that has both standard comprehension exercises and story writing – composition – exercises all contained in one book (no loose papers to get lost! ).